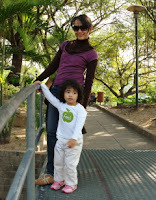 Finally we stepped our foot in Macau, after living for quite a while in HK -as if we're such a busy person, hehehe-. By ferry, we went there with Mama & Pawo & we were lucky enough to get fist class lounge with normal price (thanx to our patience being a waiting list for earlier ride). 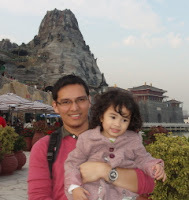 I thought 6 hours in Macau wasn't enough to see all the sightseeing, but it was done in 4 hours. Wow! Macau was actually small -didn't expect that-. Well... we didn't cover all, just the famous attractions, and we didn't gamble nor shopped, so it pretty much done in 4 hours. We saw Portuguese signs everywhere, & they say that it's the official language (& Chinese), so we assumed the citizen can speak Portuguese. "No we don't. I think even the government officers barely speak Portuguese," said the driver. Shocking! 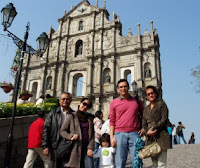 First we stopped by at the famous St. Paul's Ruins (this place is like "u r not in Macau if u don't visit this". 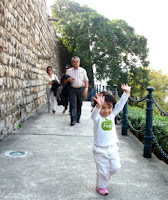 Next to it is Monte Fort, that give a splendid views of Macao on top. Then the driver passed by a lot of casinos down town -huge casinos-. We stopped at one of the casinos just to watch a dancing water fountain in front of it, pretty. 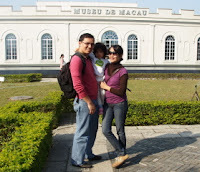 Macau museum is also inside the Fort. Then the driver took us to some temples like A Ma Temple, another one i forgot. But it was nothing compare to China's and Hong Kong's. Not interesting. Macao Tower is very tall, but it look similar with Auckland's Sky Tower, though Macau is taller. There's a bungy jumping nearby, I was so eager to try it, but it was on maintenance check. Not lucky! 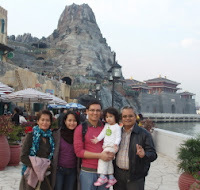 At the end of the trip, the driver dropped us at Macau Fisherman's Wharf. Naaaahh, this is the best attraction in Macau. It's a theme park that replicates Cape Town, Italy, and Amsterdam. Hehehe, at last Wina feel fun in Macau. Overall, i must say if you are not gambling in Macau, the place is less interesting. But, it wouldn't hurt to visit just to take a glimpse of this beautiful man made city that offers mortality excitement.